The FBI has launched the nation's first and only database that collects information about police-involved shootings and use-of-force incidents. Most of this announcement is incorrect. The Washington Post has been collecting data on shootings by cops for a few years now. The Guardian put a couple of years into this project before dropping it. Fatal Encounters has been around since 2012 -- the side project of former newspaper editor D. Brian Burghart... one that now requires 10 hours a day to maintain. There's even a database of dogs killed by police officers, something no one in the government has ever offered to track. So, the FBI is far from the first. It's not even the "only." But it could have been both. The FBI had a head start. The DOJ's been charged with collecting this data for more than 15 20 years now. Its efforts on this front have been nonexistent. The DOJ decided the best way to obtain compliance from the nation's law enforcement agencies was to do nothing at all. Reporting was completely voluntary, putting the FBI well behind private parties unwilling to wait for law enforcement agencies to pass along data on shootings. After 15 years of nothing, the FBI vowed to redouble its efforts. It overhauled the voluntary reporting system in 2015 and replaced it with a brand new voluntary system. Now, after having done nearly nothing to track shootings and nudge the dial towards accountability, the FBI is announcing it has the "first and only" database of its type. Halpern: The repository has the support of law enforcement agencies across the country who voluntarily submit the data. Halvorsen: It kicked off on January 1, 2019, and as of February 2019, we already have approximately 4,600 law enforcement agencies that are participating in this collection. 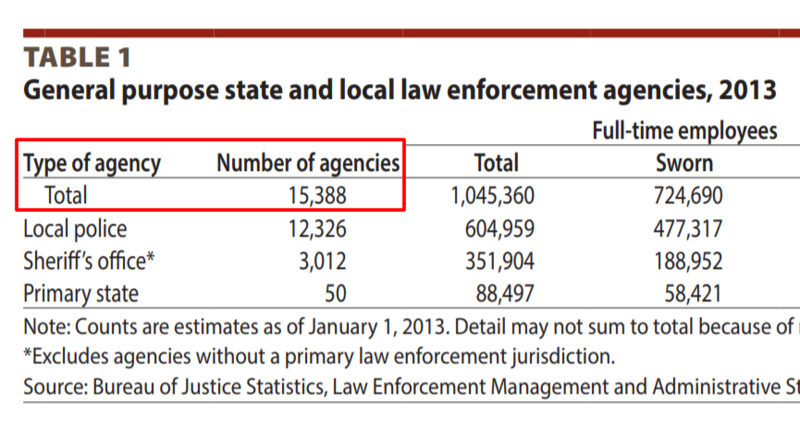 According to the DOJ's 2013 statistics, there are 15,388 law enforcement agencies in the nation. The almighty FBI has managed to secure 30% compliance with its voluntary reporting project. Spectacular. What this database will have that others won't is information on use of force incidents that don't involve an officer killing someone. That data will be useful. But it will also be woefully limited, seeing as it won't include 70% of the nation's law enforcement agencies. While it is much better than the decade-plus of the nothing the FBI traded our tax dollars for, it's simply not acceptable for the agency to believe 30% compliance is worth announcing publicly. Unfortunately, it will probably take an act of Congress to make this reporting mandatory. Until this happens, the public is being better served by journalists reporting on killings by cops, rather than waiting around for cops to tell on themselves. FBI doesn't like the data and wants to change it. That is, at least my first impression. The FBI has been mandated by congress for decades (if not approaching a century) to track law enforcement use-of-force incidents and report them to the BJS. They've just chosen not to do so and never got punished for their resistance. Now, there are several private agencies that are tracking when the police shoot people or use too much force, and the FBI is way way late to the game. Unless they're fearing a congressional crackdown (which I doubt) the only other reason I can imagine is someone in the FBI wants to change the narrative being shaped by the facts. Re: FBI doesn't like the data and wants to change it. The FBI has been the cause of most of the domestic terrorism prosecuted in the US in the last 20 years. They didn't find terrorists, they created them from low IQ people that had no intention of harming anyone. Based on that fact alone, we need to shut them down and prosecute their members for creating terrorism, not stopping it like their mandate says they need too. Since reading this at face value it's obvious that it's a blatant lie, you have to wonder under what interpretation it could be true, and I can't help but suspect that what they mean as 'first and only' is that it's the only one they will acknowledge to exist, dismissing any and all other databases by people/groups that actually do care about tracking the relevant data, where the data might conflict with any message they want to send. By claiming that it's the 'first and only' such database they seem to be attempting to gaslight people into thinking that those others don't count/don't exist, because look, it's the FBI saying it, and there's no way they would lie about something like that, so clearly those other databases are fatally flawed in some way and can be ignored. The DOJ's been charged with collecting this data for more than 15 years now. That statement links to an Oct 5, 2015 Techdirt article, “FBI Director Says Agency Will Track Police-Involved Killings Better By Not Changing Any Of Its Current Methods” which does not really support the assertion it's linked from. Perhaps you meant instead to link to this Aug 25, 2014 _Techdirt article, “Federal Law Ordering US Attorney General To Gather Data On Police Excessive Force Has Been Ignored For 20 Years” ? That article, somewhat unfortunately, contains an embedded hyperlink to a section of the US code that has now apparently been editorially reclassified. My math is all wrong. (As are my links apparently.) I will get this sorted out. Thanks for the heads up. Section 210402 of the Violent Crime Control and Law Enforcement Act of 1994 (Pub. L. 103-322) (108 Stat. 1796, 2071 – 2072) which was formerly codified at 42 U.S.C. § 14142 up through Supplement IV to the 2012 Ed. (Jan 6, 2017), was editorially reclassified to 34 U.S.C. § 12602 in Supplement V to the 2012 Ed. (Jan 12, 2018). Note that neither Title 42 nor Title 34 have been enacted as “positive law titles” within the United States Code. LII link for 34 U.S.C. § 12602. Wait until the FBI goes full Xfinity with this and offers free, unlimited access to the database, which includes the first 10 searches until the results are throttled, and then sends you a bill for an unadvertised "bandwidth usage surcharge." I'm not quite that skeptical. I have some small ray of hope they won't succeed in doing away with FOIA (and related protections) as quickly as they did Net Neutrality. After all, as a production of the U.S. Government, it has no copyright protection. So, the FBI is far from the first. Entering our third year of doing this I’m coming to the realization that I no longer have the ability to consistently track reports like I did when I started this project . . . .
Of course, I would rather not let the project die. But my only other option is to hand it over to someone else who may have a different agenda than I did. . . . This site is one component of our new National Police Misconduct Reporting Project (NPMRP). The purpose of the project is to gather news reports about police misconduct in America in a fair and unbiased way. . . . Currently, www.policemisconduct.net is redirecting me to www.unlawfulshield.com. And from the front page at that new domain there's currently a link in to “What Happened to PoliceMisconduct.net?” (archive copy).